Andrus JK, et al. Risk of vaccine-associated paralytic poliomyelitis in Latin America, 1989-91. Bull World Health Organ. 1995;73(1):33-40. PMID: 7704923; UI: 95219859. Zh Mikrobiol Epidemiol Immunobiol. ; (2):24-31 17523475 [Surveillance of acute flaccid paralysis in Belarus] [My paper] E O Samoĭlovich , M A Ermolovich , I F Kotova , E Iu Svirchevskaia , V P Shimanovich , A K Kozhemiakin , I I Protas , E V Fel'dman The ten-years experience of acute flaccid paralysis (AFP) surveillance in Belarus has been summarized. 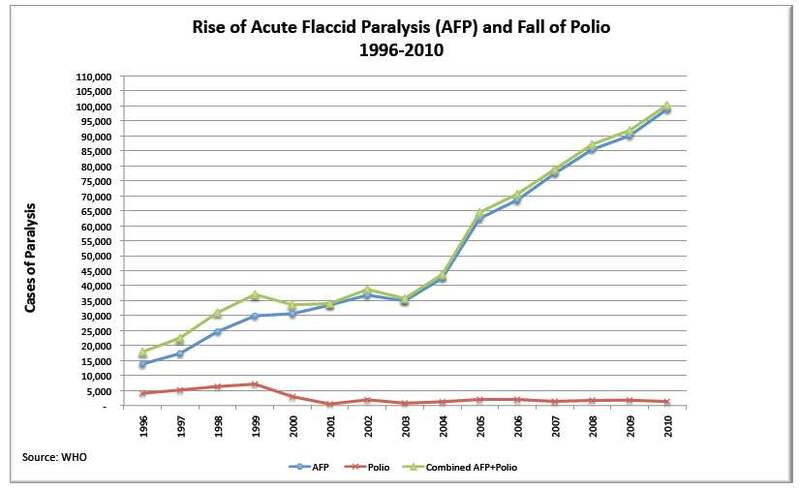 Among 456 AFP cases reported from 1996 to 2005, 11 were classified as vaccine-associated paralytic poliomyelitis (VAPP), 445--as non-polio AFP. The risk of VAPP for the period 1996-2001 was 1 case per 745,000 used doses of oral poliovaccine (OPV). For the recipients of OPV the risk was 1 case per 911,700 doses and for the first-dose recipients--1 case per 96,000 doses. 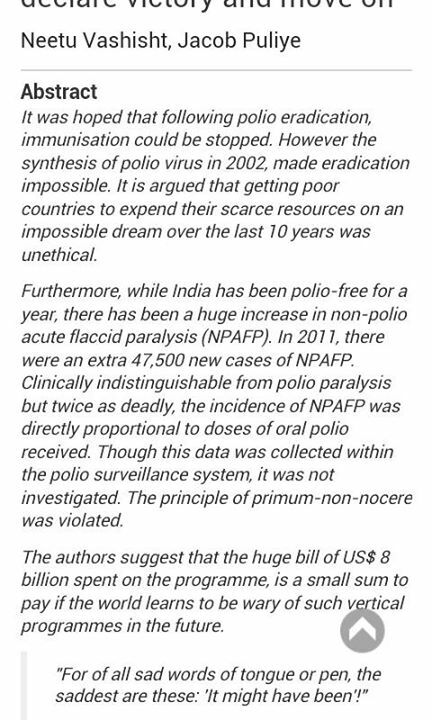 The high incidence of VAPP was a reason for implementation of sequential polio vaccination schedule in 2000. Guillain-Barre syndrome dominated among non-polio AFP (39.3% of cases); more rare were traumatic neuritis (27.9% of cases), transient monoparalysis (12.1%), myelitis (7.6%). Non-polio AFP differed from VAPP by following epidemiological and virological characteristics: predominance of previously repeatedly vaccinated against poliomyelitis; development of paralysis in long-term period after vaccination; isolation of non-polio viruses belonged to three serotypes of Coxsackie B viruses (B1, B4, B6) and six serotypes of Echo viruses (6, 7, 11, 14, 24, 25) in 8.1% of cases; absence of typical for polio residual paralyses in patients who excreted vaccine polioviruses. J Med Virol. 1989 Dec ;29 (4):315-9 2621458 [Cited: 4] An outbreak of acute flaccid paralysis in Jamaica associated with echovirus type 22. [My paper] J P Figueroa , D Ashley , D King , B Hull An outbreak of acute flaccid paralysis in Jamaica in 1986 associated with echovirus type 22 is described. Six patients aged 1 to 27 years developed acute onset of severe flaccid paralysis, with inability to walk. Three cases had facial weakness, four required intensive care with assisted ventilation, and two died. Echovirus type 22 was isolated from the stool of two patients who showed a significant increase in antibody titre. Echovirus type 22 was also isolated from the stool of another patient who had aseptic meningitis without any neurological deficit. There was no evidence of poliovirus infection in any of these patients, most of whom were fully immunized. Of the four surviving cases with flaccid paralysis, three had residual weakness in their lower limbs and walked with an abnormal gait 3 years after the acute paralytic attack. This is the first report in the literature of acute flaccid paralysis associated with type 22 echovirus. They caused a substantial, huge outbreak of polio but they started discarding most of the cases (put as flaccid paralysis). "Viera Scheibner, Ph.D.